Inside: Post Pregnancy Workout: How to Exercise After Having a Baby in 3 Simple Steps. Giving birth is a empowering experience. It’s also an extremely challenging ordeal and it leaves behind long-term effects you will need to deal with. Getting back into a healthy exercise routine is often tricky once you have become a mom. Use these general suggestions for your post pregnancy workout as you ease your way back into a good fitness regimen. The first and most important rule to follow is to heed the instructions of your doctor when it comes to getting back into your post pregnancy workout routine. Doctors will counsel caution, but it doesn’t pay to try and second-guess them in this situation. Most mothers are ready to start working out roughly a month to six weeks after giving birth, but this can vary hugely based on your specific circumstances. How your birth played out will have a big role in determining how quickly you bounce back. A normal vaginal birth without complications is (at least in theory) pretty easy to recover from; you simply need rest and good nutrition. C-Sections and other more invasive surgeries are a very different story. Listen to what your doctor tells you about recovering from a birth that involved any form of surgery. He or she may veto certain forms or exercise as well as recommend specific exercises to help you strengthen your pelvic floor. Virtually everyone wants to start working out after having a baby in order to shed the excess weight left behind. Some superstars are back in the gym just days after giving birth while other women need months to pull themselves together. The difference isn’t all about genetics or how challenging your birth was; a lot of it depends on what your body is already used to. Those super-moms who are running 5ks soon after they give birth? They were dedicated runners who considered 5k races trivial before they got pregnant. 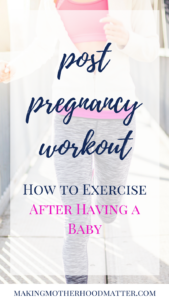 If you weren’t engaged in a strenuous exercise program prior to your pregnancy, you probably won’t be able to leap into one afterwards, no matter how long you take to recuperate. Let your previous fitness experience dictate where you get started and always take your expectations down several notches when you resume working out. No matter what form of exercise you choose to try, don’t push yourself into it too hard. Pregnancy has a host of different effects on you – physical, hormonal, and mental – even after delivery, and it’s not realistic to expect everything to be the same as it used to be. Don’t continue to do exercises that get painful, even if they were easy for you before your pregnancy. If you’re struggling to find the motivation you need to get back in shape, try reaching out to others in the same situation. Get in touch with other mothers who were in your lamaze or childbirth courses to see if they would be interested in buddying up at the gym. You should also ask your partner and your family members for support and ask them for help so that you can carve out dedicated exercise time in your schedule. It takes time and patience to resume a regular exercise routine after you have given birth. Don’t rush things and listen to what your body (and your doctor!) tells you. It will take practice to get your fitness level back to where it was pre-pregnancy and there is no deadline you need to hit in getting there. Define your own pace with your post pregnancy workout. This post was written by Jeff from the blog, Family Sport Health. Jeff Elrod loves everything about family, sports and health and has developed a website to help families focus on staying active together. To learn more, visit FamilySportHealth.com. P.S. If you enjoyed this piece, you may also like Survival Guide for the Sleep Deprived Parent: 7 Strategies to Help Your Baby Sleep Through the Night. I'm currently pregnant with my second child, so this will be extremely helpful after I give birth! Nice post! Hi Jennifer! Thank you for stopping by. I am so glad you found this article useful. We have tons of resources for mamas post-pregnancy.